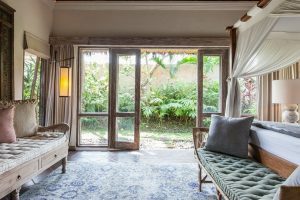 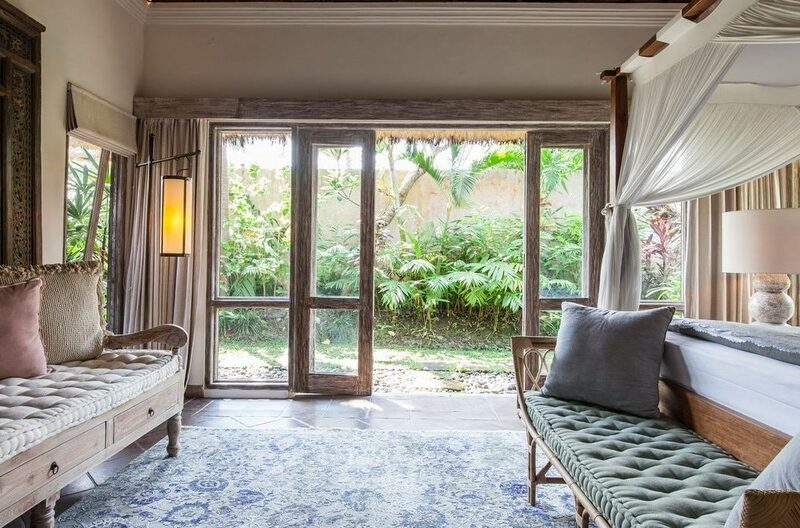 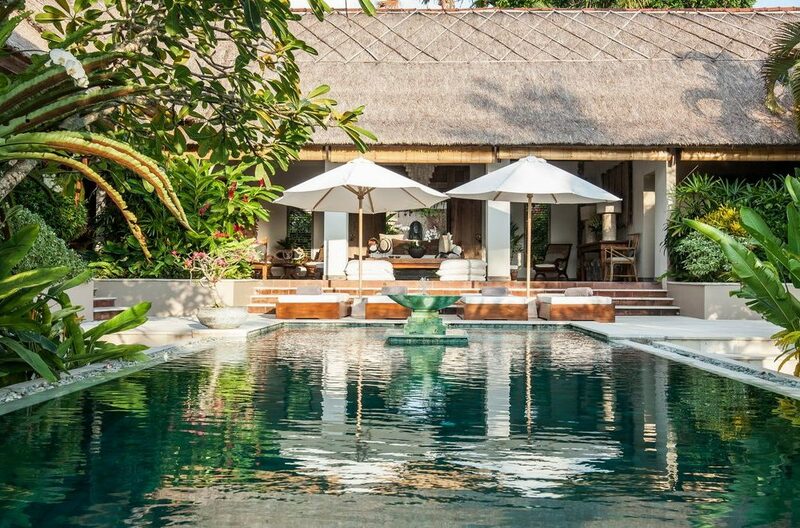 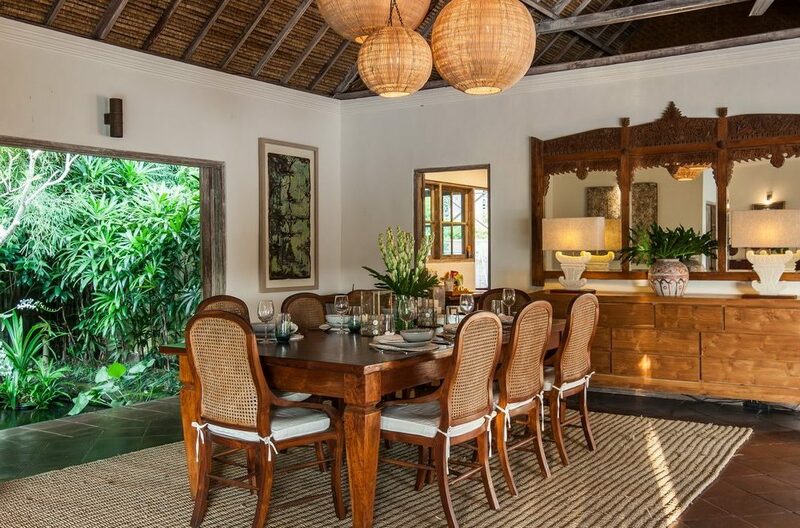 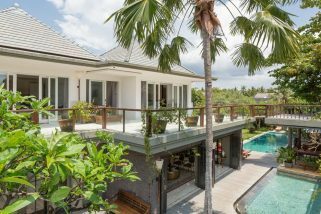 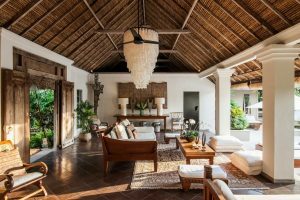 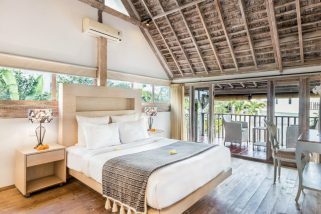 Villa Inti is a stunning, five-bedroom sanctuary that overlooks the lush rice terraces of Bali’s hip surf utopia, Canggu. If you’re looking for somewhere special for your family or a group of friends, this property will satisfy on every level. 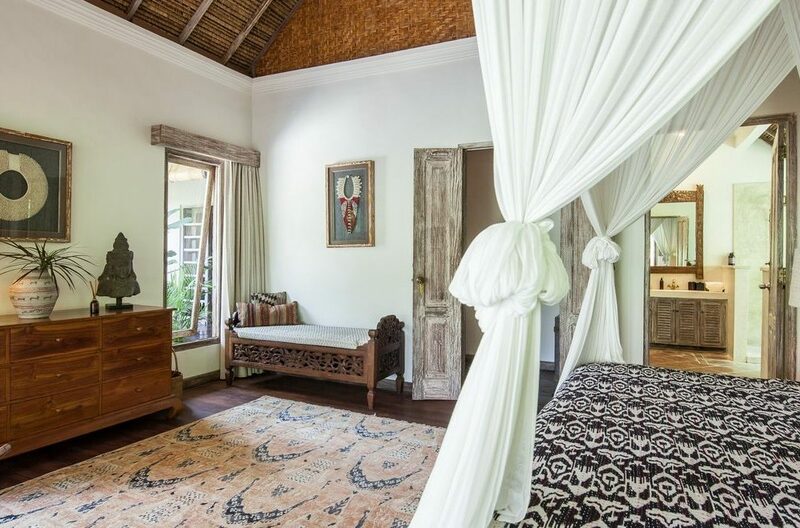 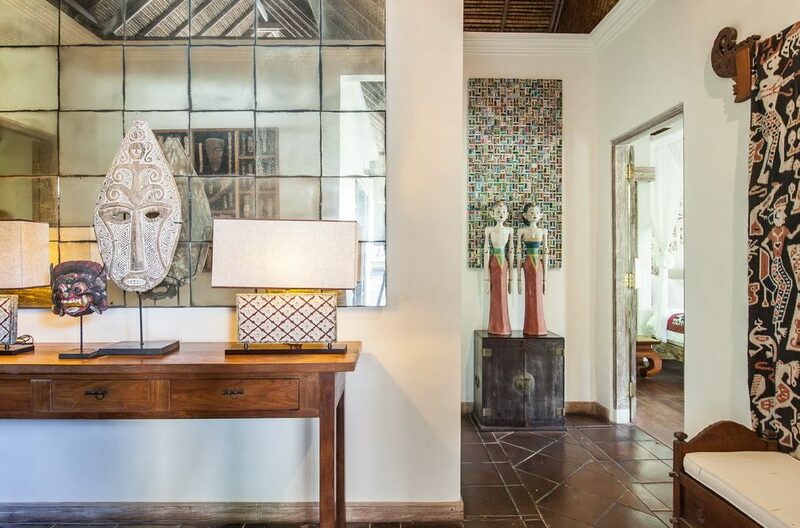 Step in through the large, hand-carved wooden doors and let the splendor of Villa Inti take a hold of you. 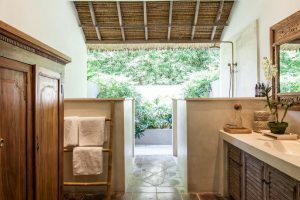 Villa Inti accommodates up to ten people in five superb ensuite bedrooms. 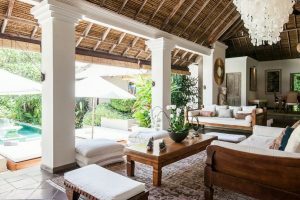 The open-air living and dining area is contained in a large pavilion with ultra-high ceilings overlooking the large private pool. 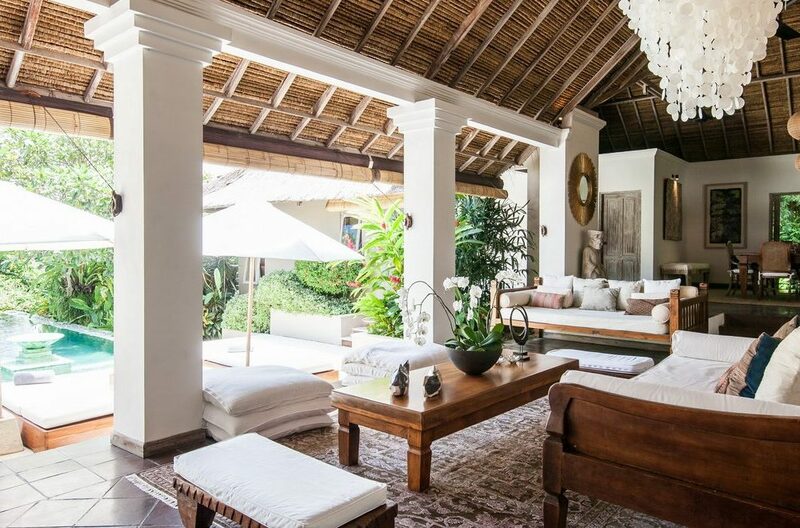 With stunning rice terrace views, it’s the perfect place to spend your mornings lazing around on the large sofa, or relaxing with loved ones in the evenings. 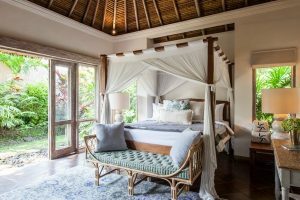 Your stay at Villa Inti comes complete with a daily complimentary breakfast made lovingly by the warm staff. 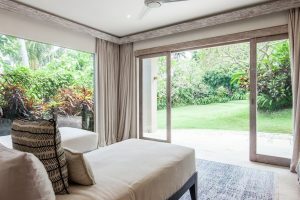 You’ll be taken care of by Villa Inti’s highly professional team that includes a daily housekeeper, gardeners and pool attendants as well as a villa manager. 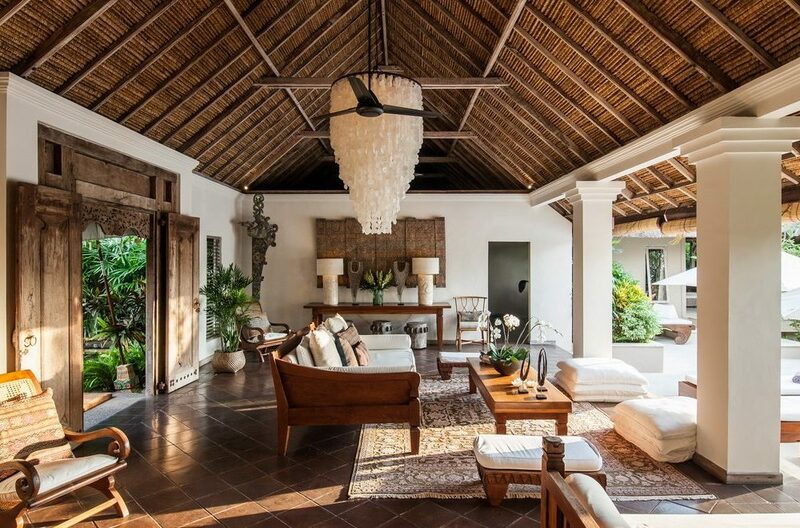 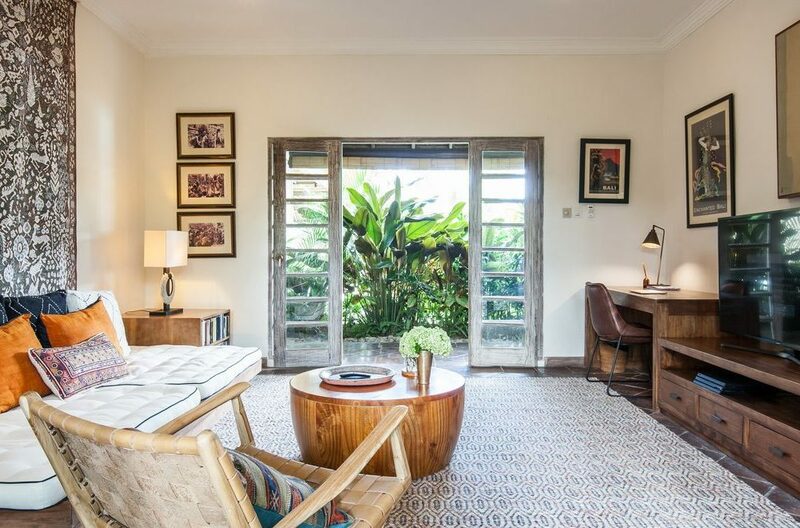 The living area at Villa Inti in Canggu is absolutely spectacular. 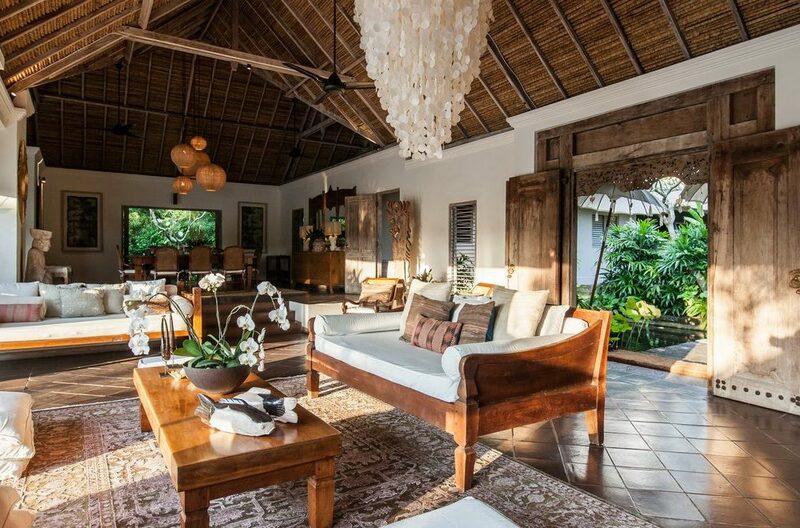 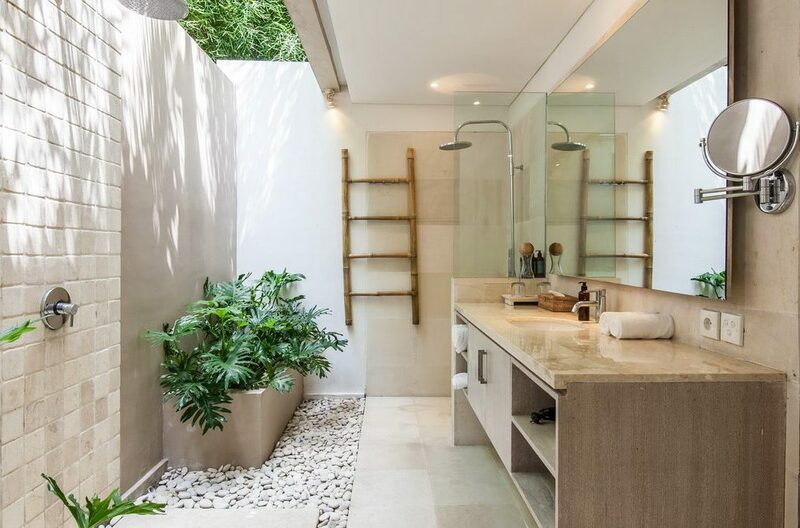 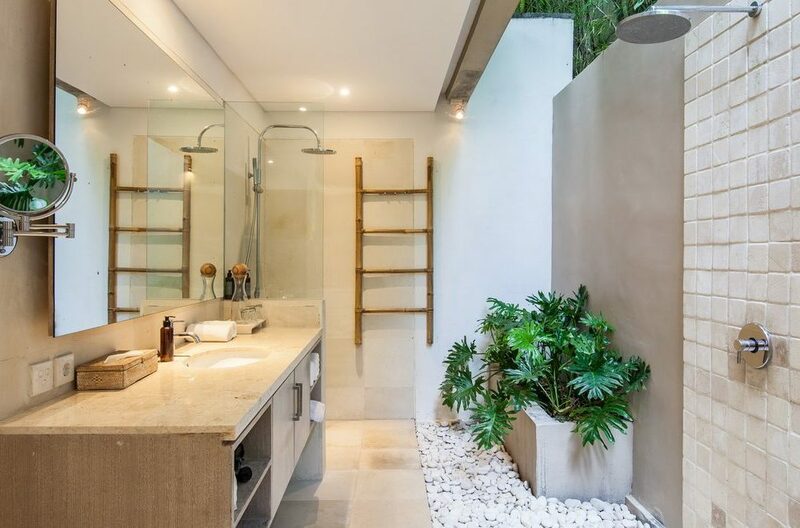 Designed in an open-plan style, it seamlessly blends the tropical outdoors with comfortably furnished interiors. 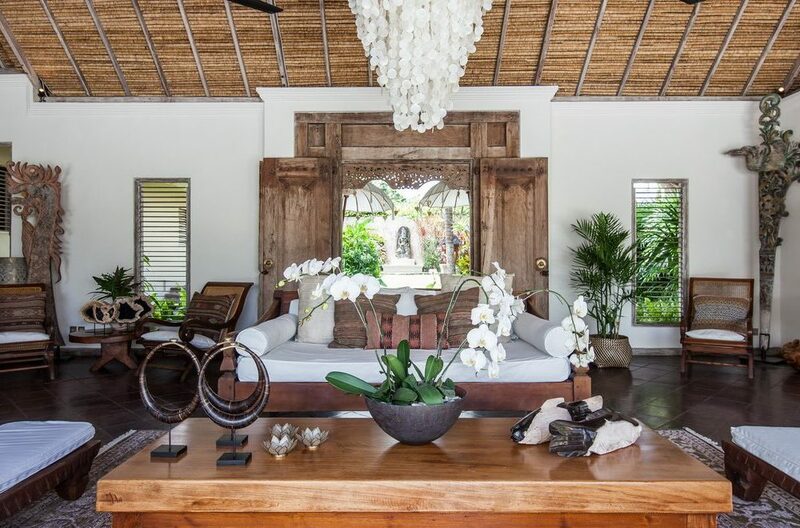 Tropical orchids add a fresh, floral element to the rich wooden scheme of the room. 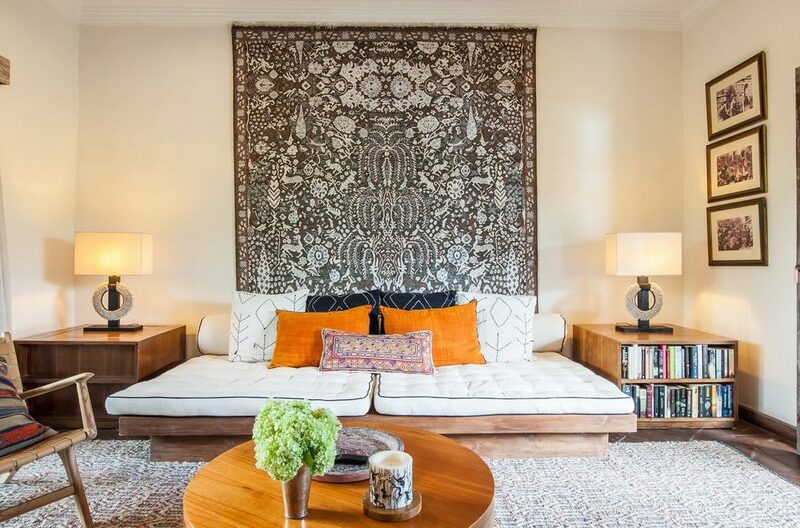 The impressive beige sofa invites you to lie back with loved ones. 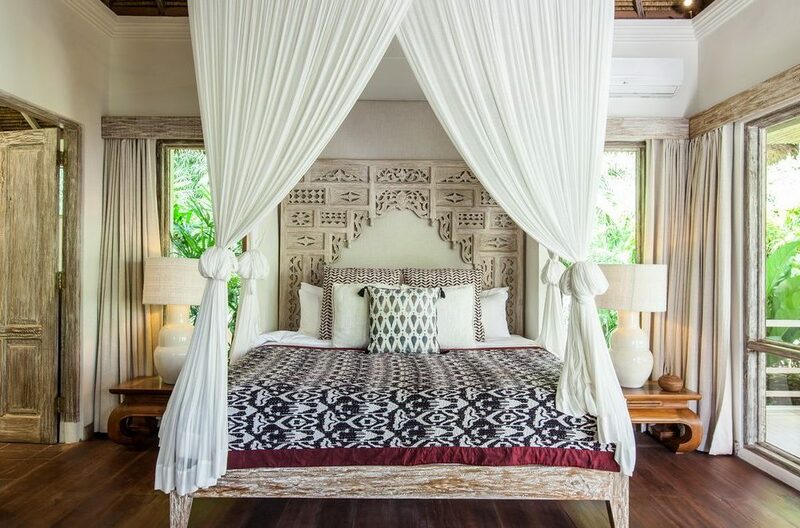 Or, if you’d prefer some alone time, just cozy up on a cushioned day bed adorned with colorful silk pillows. 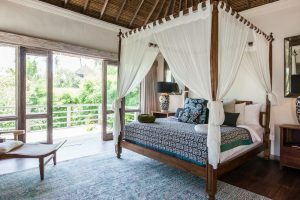 By day, you’ll adore taking in the breathtaking views and by night, the soothing sounds of the crickets and the cool evening air are sure to tantalize. 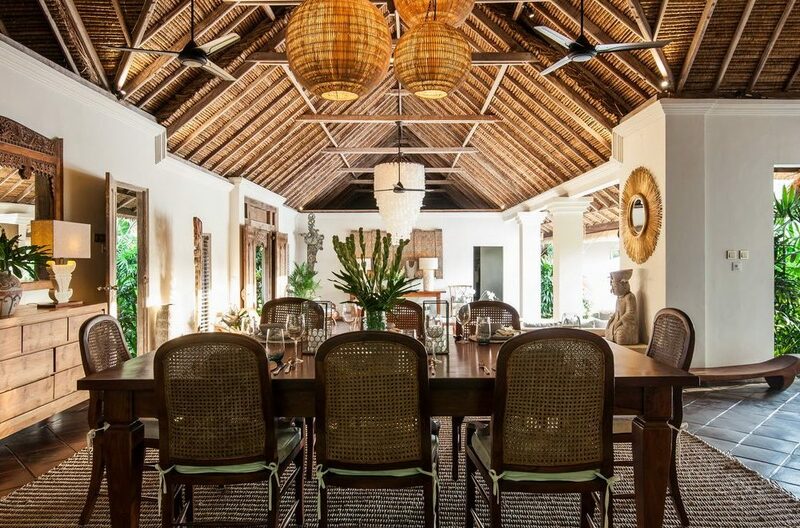 The impressive dining table at Villa Inti seats 10 adults comfortably and is a lovely setting for a dinner party. 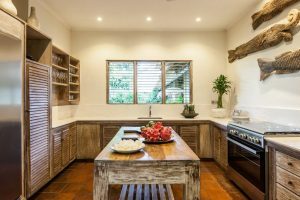 If you feel like being spoiled, you can request a private chef at an extra fee. Alternatively, if you’re after a more relaxed family meal, you can order food for delivery from a range of great restaurants. 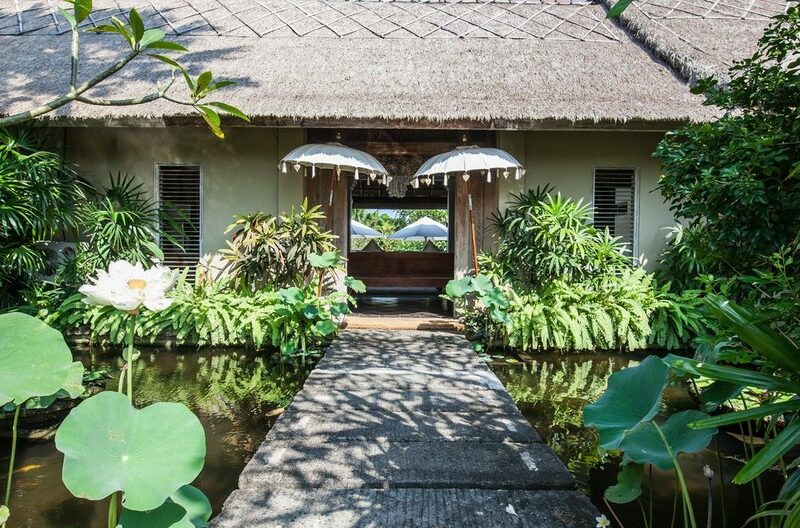 The garden itself is a beautiful sight. 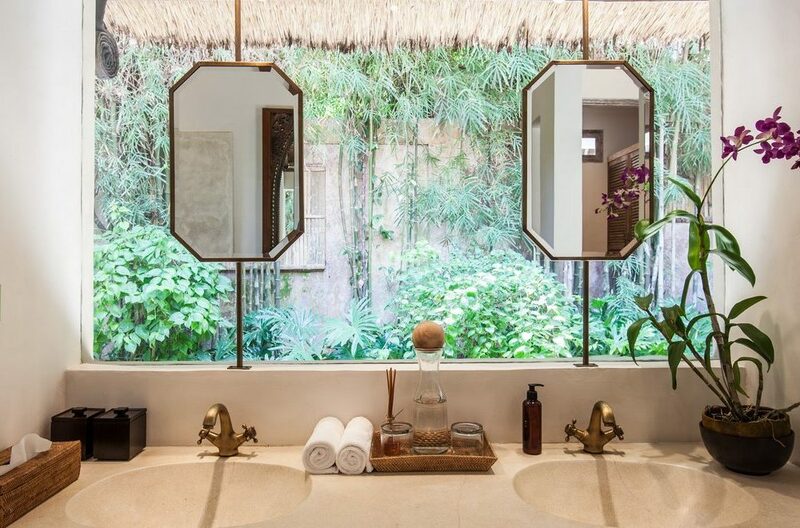 Enjoy a walk in your private oasis with its tropical plants and flowers, palm trees as well as fish and lily ponds. 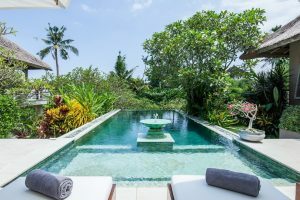 The swimming pool can be seen from most parts of the villa, tempting you for a dip in its cool, iridescent waters. 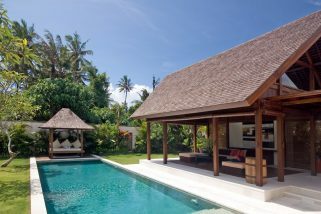 From there you can make your way to one of the sun loungers and kick back with a cold beverage in hand. 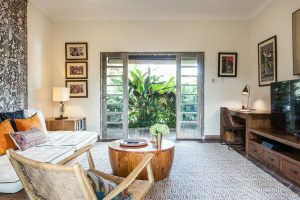 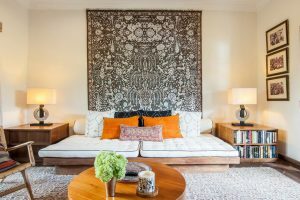 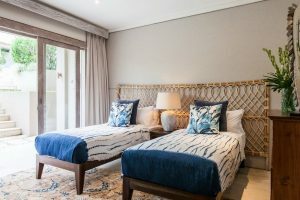 The kids can retreat to the media room, where they can snuggle up on the large couch, turn on the air-conditioners and watch movies on the flat screen TV. The bedroom suites at Villa Inti were designed with a sophisticated and clean visual scheme. 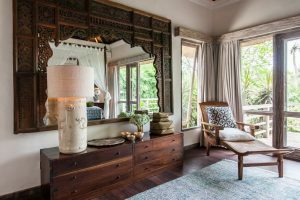 The combination of white walls and linens with dark mahogany floors and furniture exudes a chic, post-colonial aesthetic. The four-poster beds contain deluxe, king-size, coil-spring mattresses and are netted for extra privacy and comfort. 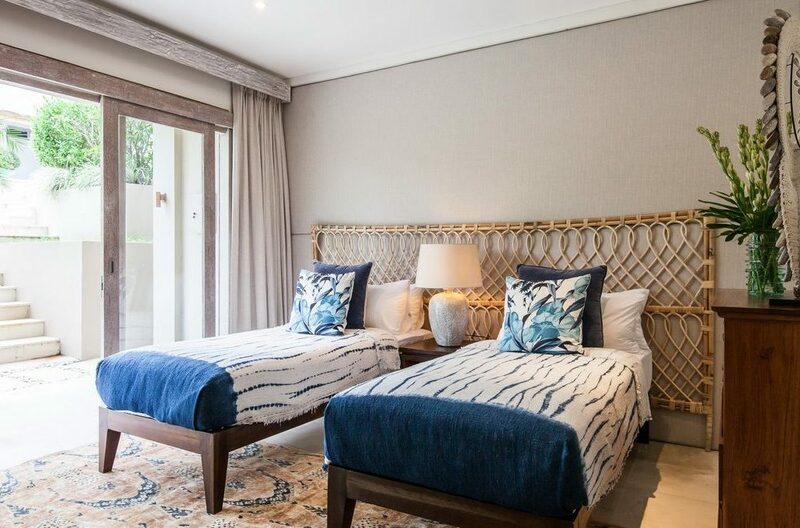 All bedrooms are fully air conditioned and come with impressive ensuite bathrooms. 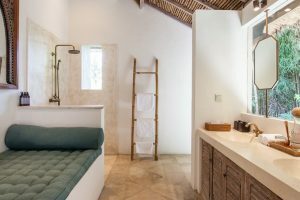 The bathrooms were designed with the same color scheme and contain bathtubs, high-pressure showers and two washbasins. 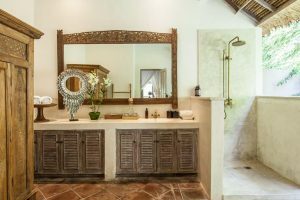 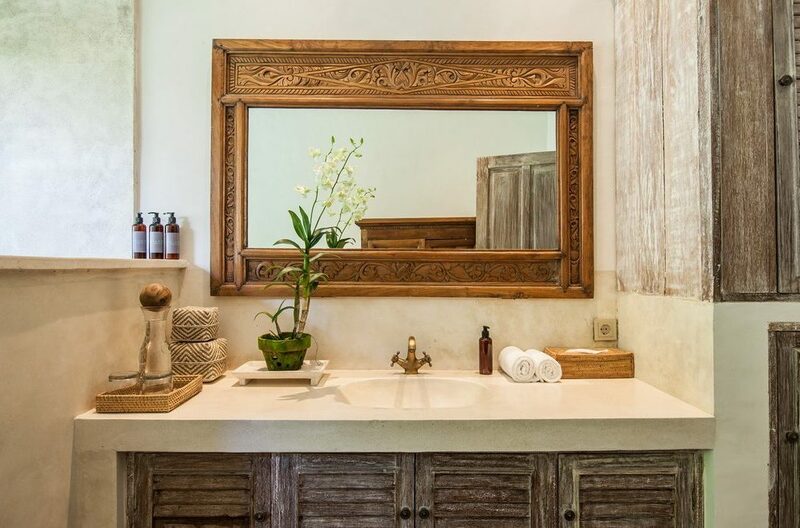 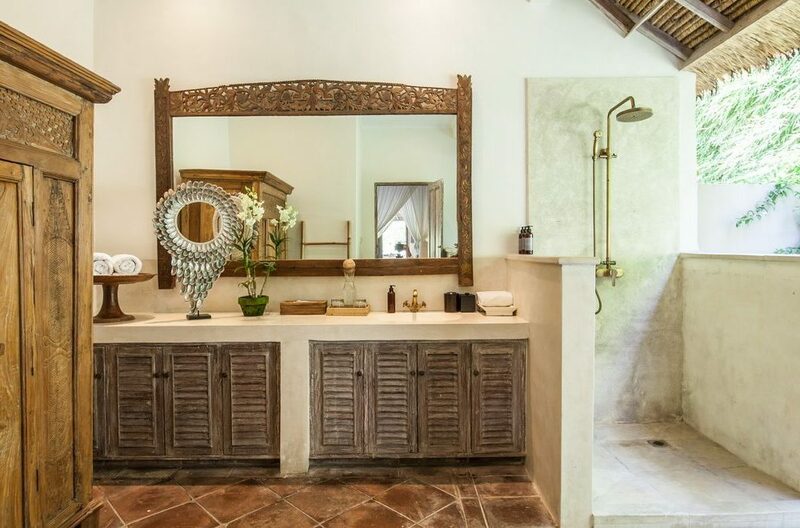 The bathrooms were finished with the highest specifications and decorated with enormous, hand-carved wooden mirrors. 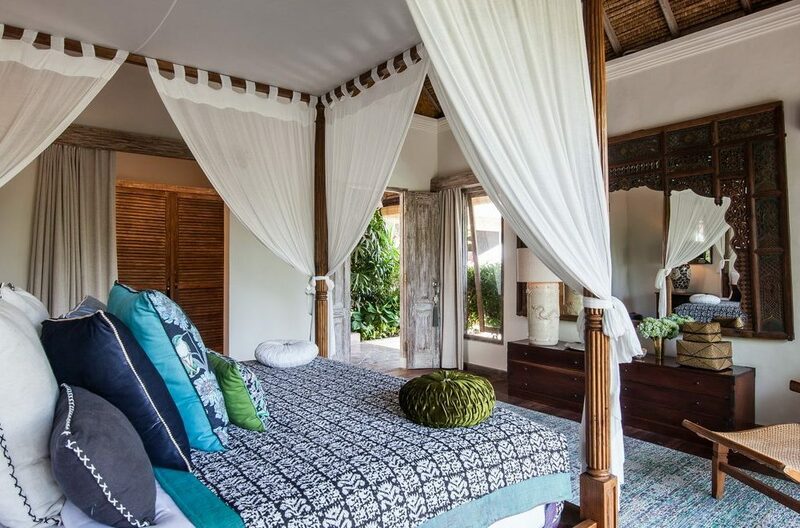 A stay at Villa Inti in Bali comes complete with eight dedicated staff members. On arrival you’ll be greeted by the villa manager who will assist you in making any bookings, from restaurants to day trips. 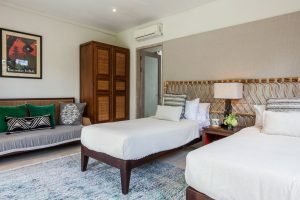 You’ll also enjoy a daily breakfast, housekeeping, laundry service, a gardener and pool attendant. 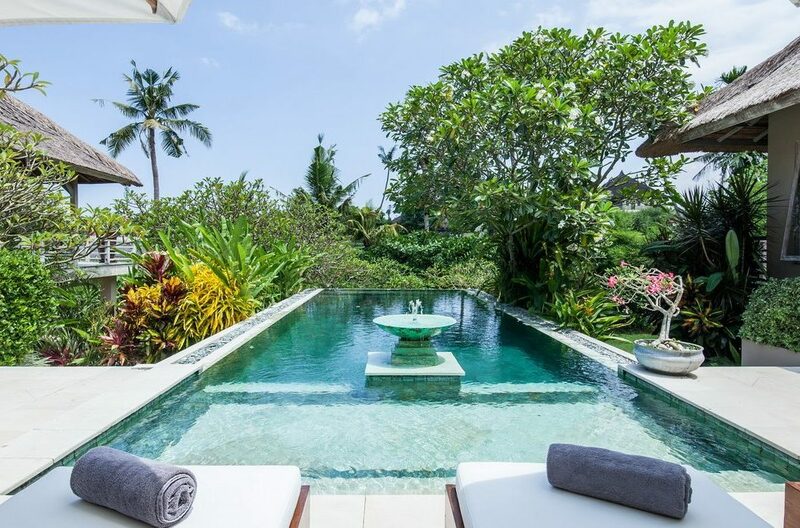 Canggu is a laid-back area known for its idyllic rice fields and world-renown surf breaks. Head to Batu Bolong for a beginners surf lesson, or if you’re a little more seasoned, Berawa or Echo beach will do the trick. You can also find several great restaurants in Canggu, such as ‘One Eyed Jack’ for tapas-style Japanese, or ‘Echo Beach Seafood’ for a laidback experience. 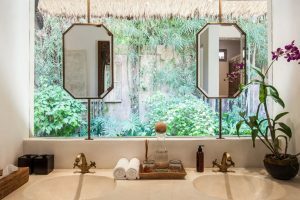 If you want to get your hands on a great cup of coffee, you’re in luck – Canggu is home to numerous cafés like ‘Milk & Madu’, ‘Veda’ and ‘Hungry Bird’ that specialize in a good brew. They also make healthy, delicious food and have tons of vegetarian and vegan options. 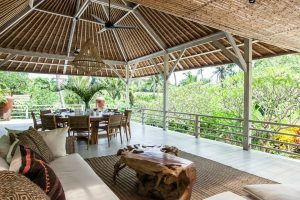 Canggu is only 20 to 30-minutes away from Seminyak and its buzzing nightlife if you’re up for something more exciting. 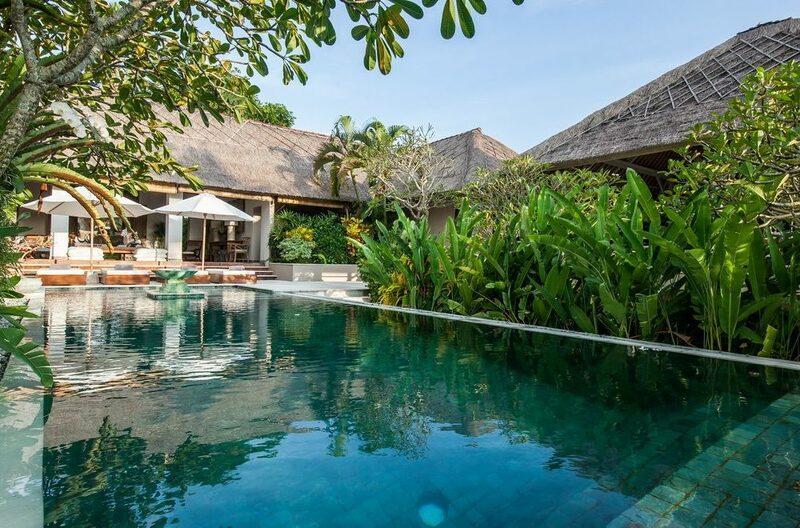 Villa Inti is approximately 45-minutes from the Bali’s international airport. 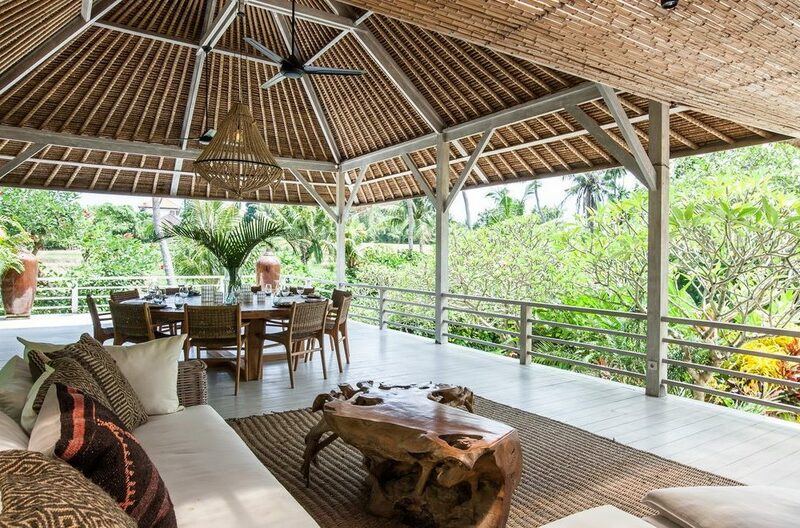 The Padang styled high pitched shingle roof of the main pavilion soars above a spacious open-aired living area.